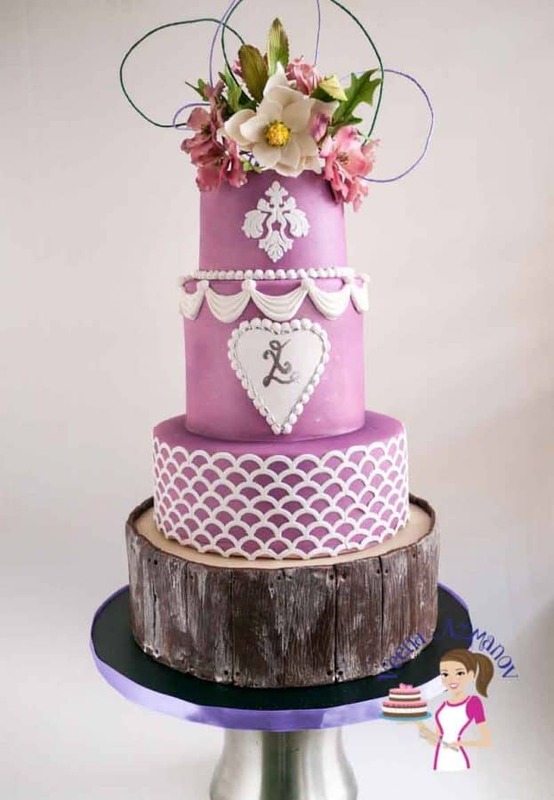 This violet wedding cake were a real pleasure to make. 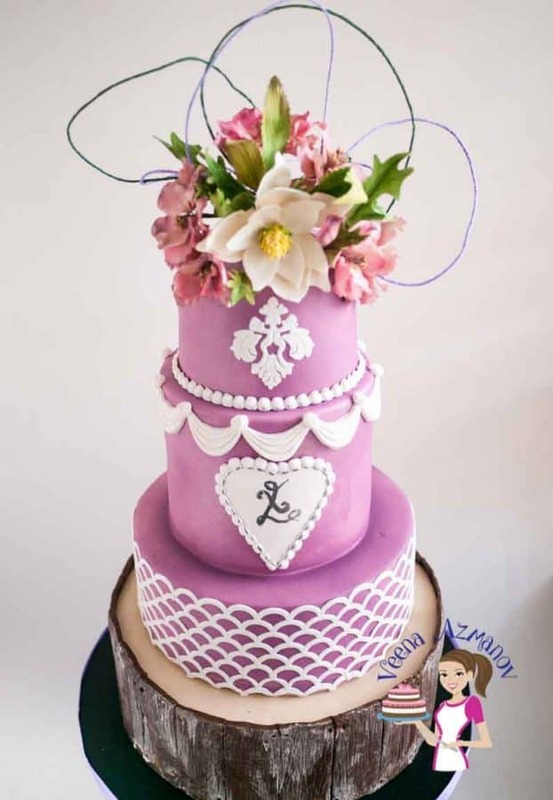 Commissioned by the bride to make a bright violet and white contrast. Adorned with blush rose pink cosmos and a show stopper sugar magnolia. I must say I really enjoyed making this cake!! The violet is such a beautiful color and the white in contract was just absolutely perfect. The sugar flowers are some really gorgeous cosmos and one of my favorite magnolias!! If you look at the cake it’s pretty simple in terms of technique. The most important being the basics. Which I have already shared with you before. How to get sharp edges on your buttercream and ganache cakes as well as how to get sharp edges on fondant cakes (video coming soon). Once you get the basics mastered… the rest is fun! Yes fun!! The top three ties are covered in white Satin Ice fondant and then airbrushed in Magic Colours Violet airbrush colors..
For the second tier I have use again Marvelous Molds Swag Mold. The bottom tier has been covered using a panel method. 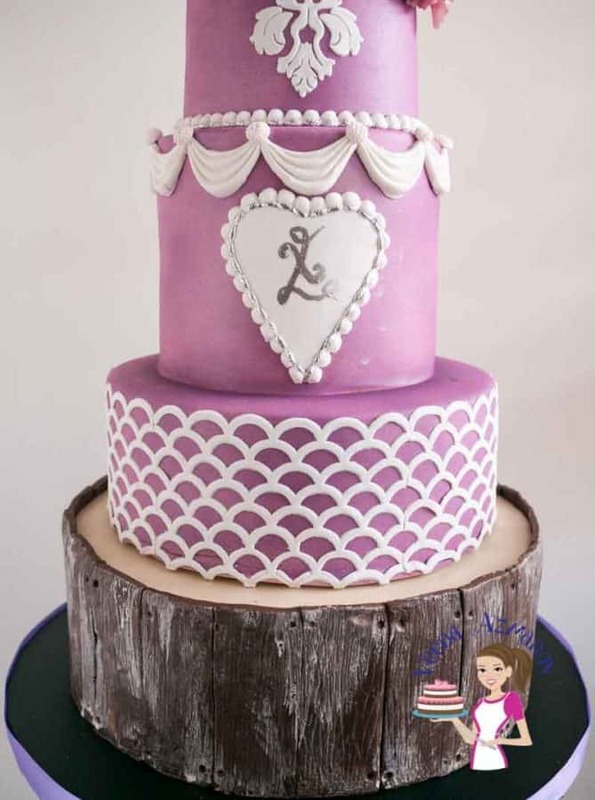 I covered the top of the cake with Ivory fondant. Rolled a long strip of brown fondant and textured it with the wood grain mat. Wrapped it around my cake then paneled it. I also gave it washed effect to add more depth with white gel color. How to use Silicone Onlays in Summer. I do plan to make more sugar flower tutorials in future but you can learn to make the Cosmos and Magnolia on Maggie Austins Craftsy Class. I love when I get to showcase some of my premium flavors with my wedding cakes. Often a reason why people tend to remember my work. Nothing beats the joy you get when a new customer calls and says. I tasted your cake at a previous wedding we attended and we loved it. The third from the bottom is my Coconut Cake with coconut cream filling and Swiss meringue buttercream. The Top tier is my creamy carrot cake with Swiss Meringue Buttercream. Some of the above recipes are from my Calculated Recipe collections created specially for cake decorators. 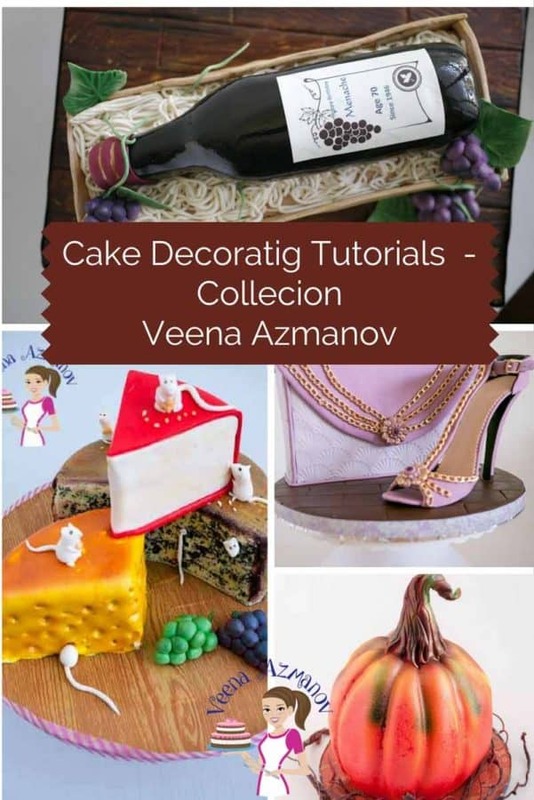 BUT if you are not a cake decorator you can find many of these flavors in my free cake recipe sections such as moist carrot cake, chocolate cake, vanilla cake and coconut cake . 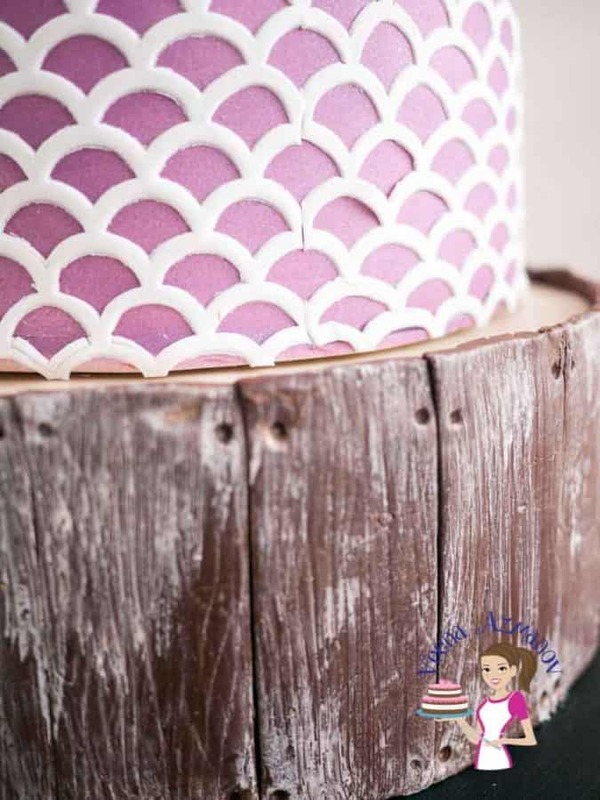 If you like cake decorating you may like to check out the whole list of cake decorating tutorials and decorated cakes where I share similar information. Good and Inspiring work Mam. Love to see this kind of perfection. I love your work and appreciate your posts! 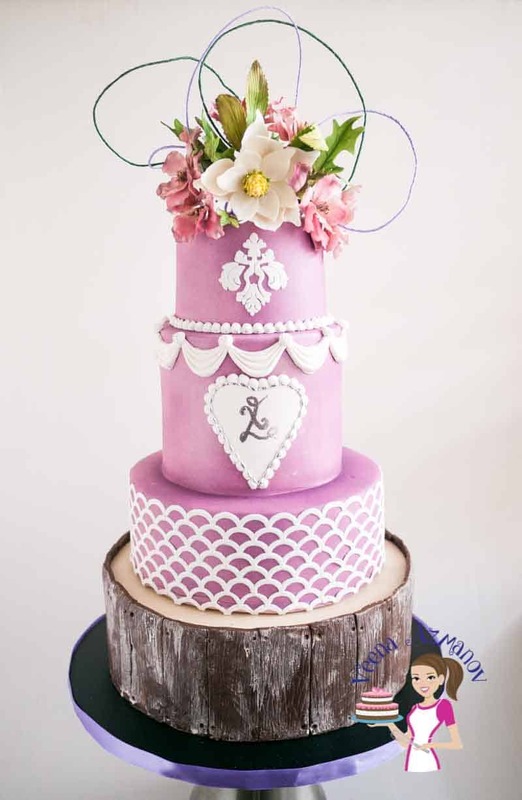 I have a quick question regarding this violet wedding cake: how did you make the purple “flourishes” at the top? Is it covered wire? If so, what did you cover it with? Thank you!! Thanks Sheri. Those are made of paper. They do not have have wires in them. Usually used by florist. I have no clue what they call them. Perhaps check with a florist.